There are perfumes simply branded with celebrity names, and then there are perfumes celebrities have a firm role in creating. I don’t know if you’d call photographer Christophe Jouany a celebrity exactly, but his fragrances, Jouany Perfumes St Barthélemy and Marrakech, come straight from his own, personal mixes of essential oils. “I created my own formulas,” he replied when I asked via his public relations company which perfumers he had worked with for St. Barthélemy and Marrakech. 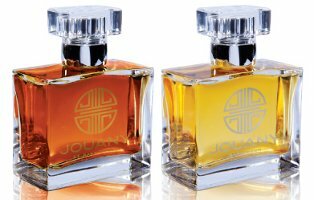 Enough people complimented Jouany on his oil blends over the past decade that he decided to produce two of them for the public. He said noses Jean Pierre Subrenat and Udo Ludwig tested the fragrances to “make sure they were well balanced” and see if they needed anything extra. Now, Udo Ludwig is in charge of producing the compounds for the fragrances through the firm Creative Fragrances. Marrakech has notes of orange blossom, bergamot, grapefruit, jasmine, neroli, patchouli, and white musk. According to Jouany, 75% of Marrakech’s compound is essential oils. Marrakech is all about orange blossom and musk. The orange blossom reads less like a bridal show and more like damp, petal-laden craft paper — but I like that. Neroli adds juiciness to the orange blossom. The patchouli and jasmine don’t stand out to me distinctly, and the fragrance is less overtly floral than you might imagine from its notes. Marrakech does a good job avoiding the all-too-common "gas station soap accord" that can arise from a musk-orange blossom combination. To me, both men and women, even those cleaving to traditional gender expectations, could wear either scent comfortably. Both fragrances stay fairly close — although not tight — to the body, and they last about half a day. One friend I asked for an opinion said I smelled “clean and soft.” Even though I had two spritzes of each fragrance on (one fragrance on each arm), she couldn’t smell it from across a café table. When I got up, she said a nicely scented whiff blew by. I think they’d be safe office fragrances, especially Marrakech. If the Jouany Perfumes line has a signature, it’s white musk. I think that’s what attracts me to these fragrances. Although clean musk fragrances are a dime a dozen these days, white musk hasn’t been in fashion since Jovan’s heyday in the late 1970s. Maybe it’s time for a resurgence. Neither of these fragrances is wildly original, but I can’t think of anything like them on the shelf at Macy’s. They feel warm, soft, and personal. They’re perfect bedtime perfumes. I’ll be sad when my time with them is over. Jouany Perfumes St. Barthélemy and Marrakech can be found at Beautyhabit, Henri Bendel, and at the Jouany Perfumes website, $125 each for 50 ml Eau de Parfum. Both of these sound very lovely, especially Marrakech- I’m a sucker for neroli, and if its not overly floral, that makes it me friendly. And the price is right, too- not wildly expensive, but costly enough to make me feel confident in the ingredients. They’re pretty fragrances–soft and comfortable. Make sure you like white musk, though, before you sample! Angela? Fresno? As in Central Cali, Fresno? Don’t you think it would make an alluring locale for a fragrance? Seriously, though, I was just trying to think of towns that aren’t especially glamorous (but please don’t take offense if you live in Fresno!). i don’t live in fresno (an even smaller, less glamorous – yes, that is possible! – town just outside of Fresno. The fragrance here would smell of daries and oranges). I just was a little shocked that you mentioned it in the first place!!! I thought, WHAT? does someone who loves fragrance as I do actually live around here?!?! I love the idea of a fragrance redolent of dairies and oranges! That sounds much more intriguing than some boring old fragrance rehashing Gotham or something like that. I bet there are some perfume lovers near you. We lurk all around….just follow your nose. The citrus orchards are the nicest thing about Central Valley farmlands. . . dairies and feedlots, not so much. OMG, where? Dos Palos? South Dos Palos? gg perfume – i’m in visalia…are you in dos palos?! see, here i thought i was the only one in between SF and LA!! Sorry, Bunzabee, I’m not in the Valley at all, but my parents used to live in Fresno (exiled, as my mother saw it, when my father’s employer moved the business there) and used the phrase “Dos Palos and South Dos Palos” as jokey code for “Hicksville”. Mean, but true! Funny, the Australian niche brand Aesop, recently gone global, also has a fragrance called Marrakech. I suppose Jouany Perfumes thought that their market is distinct enough from Aesop to risk using the same name. I often wonder how these things are decided. Aesop’s Marrakech plays heavily on the spice market and hot desert wind ideas that you would expect of a perfume with that name. Not an orange blossom in sight! I like the sound of the Aesop Marrakech, but you’re right–it sounds distinctly different from the Jouany Marrakech. Maybe someday I’ll go to Marrakech and be able to form my own opinion! Dear me, a perfume that carries the complexity of human history on its shoulders! Wow! That’s quite a burden for a little bottle. Knights, monks, despots, hillside–there’s a lot going on in Mystra. I’m not sure I’m ready for an all-out resurgence of white musk, but I could certainly use another perfect bedtime perfume (or two) for the cold, dark winter months. Thanks for reviewing these, Angela! It was surprising to smell so much musk, after everything else I’ve been smelling. I suppose if everything out there were loaded with white musk I would have felt different, but instead the change was welcome. I am testing these right now – both are very light and easy to wear, and very likeable. The St. Barth one has a very earthy smell to me, kind of like that note you get in Diptyque Oyedo under the grapefruit scent. Marrakech is a delicate orange blossom musk. I would be happy to receive either one as a gift but depending on how much longevity I get out of them, I am not sure I would spring $125. I like my perfumes to last all day. Thanks for stopping by to say how you like the Jouanys. I know what you mean about St Barth’s earthy smell–do you think it’s the cocoa? The samples were both nice-finely honed comes to mind. From the notes I thought that Marrakech would be my favorite, but not so. Happily would I add either one to my fragrance wardrobe, anyway. What I like about them is how different they are than so much on the market. It will be interesting to see what else Jouany comes out with!